I had a fantastic Thanksgiving weekend, and I can only hope yours was as good. I spent a lot of time with family, and thus the lack of posts. Anyway, just wanted to run through and do a quick scan of what happened in the Big Sky from Wednesday-Sunday, team by team. 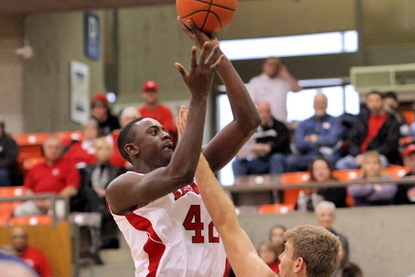 - EWU took down UC Davis thanks to a 19-1 run and a huge game from F Cliff Ederaine. The senior forward had 23 points, 8 rebounds, and 7 assists, having the best all-around game of his career. On a night when leading scorer Collin Chiverton struggled a bit, 4 other guys scored in double figures for the Eagles. - The Bengals had a tough weekend, as they lost in OT to Loyola Marymount and got beat 75-62 by Utah State, dropping them to 1-4. The bright spot was Melvin Morgan, who had 24 points in each game and is finally becoming the player they thought he would be. - Jakub Kusmieruk missed the Utah State game and played only 16 minutes against LMU, anyone know what happened to him? - It doesn't get a lot easier for the Bengals. They travel to take on New Mexico and then get North Dakota at home, a team that beat them 63-47 earlier this year. - As covered last night, Montana took out Long Beach State on Saturday night for the biggest Big Sky win of the weekend. Long Beach State has been getting a lot of national respect, so hopefully the Grizzlies can get a little bit of that. - On Wednesday, Montana went to North Dakota and lost a tough game to UND, 88-81 in OT. As has often been the case, the big men did not get involved, and that was a big part of their undoing. - Things were looking sky high for the Bobcats after they beat Utah last week, but the hype has started to slow a bit. First, they lost at home to Seattle by 12, and then dropped a road game to Idaho. All of a sudden, the Bobcats are 2-3 with games against San Jose State and Cal State Bakersfield coming up. They are still struggling to get consistency from their three wings - Xavier Johnson-Blount, Jamie Stewart, and Shawn Reid. Those three have not been able to all put it together for one game yet this year. - The Lumberjacks beat NAIA Northern New Mexico by 31, but then lost on the road to Loyola Marymount, 81-61. After 6 games, freshman James Douglas is the leading scorer with 13.7 PPG, nobody is over 8.3. He has been the only semi-consistent threat for them. - They will now take on BYU on Wednesday in the Lumberjack Classic. It could be a good learning experience for NAU if they can keep the game competitive. - UNC started things with a tough game on the road against Iowa State, and lost 90-82. They played pretty well, just struggled to slow down the Cyclones offensive attack, which could be pretty good under Fred Hoiberg. Freshman Tim Huskission led the team with 16 points. - In the South Padres Invitational, the Bears won their first two games of the season. The first was against Western Carolina, which the Bears won by 17, led by Connor Osborne's 16 points. The next day they took down Southern for a 20 point win, as Mike Proctor and Emmanuel Addo each had 10 points in a balanced effort. Getting a couple wins should be a nice confidence boost for a young team, and they have a couple more cupcakes this week, so they should be 4-4 when they take on Denver in a couple weeks. - The Vikings also picked up a couple wins in a holiday tournament, winning 2 of 3 in the Wyoming Jim Thorpe Classic. They beat Louisiana Tech 66-48 thanks to 27 from Charles Odum, and then took out Maryland East-Shore 79-69 after 25 more points from Odum. They haven't really beaten anyone yet, but they do stand 4-2. - They started the Classic with a 14 points loss to Wyoming, a game that they could not get their offense going. - The Hornets began things with their big win over UC Davis, but they could not continue the momentum against McNeese State, falling 68-63. The Hornets led by 17 at half, but were outscored 45-23 after intermission, a tough one to take at home. The loss drops them to 3-2, and could come back to haunt them in their quest for .500. - Weber State took down Jacksonville State on Sunday night, setting up a huge game with St. Mary's tonight. Damian Lillard showed why he is the star of the Conference, posting 23 points and 8 rebounds. Anything I missed over the weekend? Jakub Kusmieruk of ISU has a bruised shoulder, he took a elbow during the LMU game, came out, and then later went in only to come out again.